Last year, if you would have asked me what I thought about cloth diapers, I would have told you that I would never EVER consider using them. I don't need to create extra work for myself. I never was familiar with them at all. No one that I knew had ever used them so I wasn't educated about CDIng myself. Then something happened. 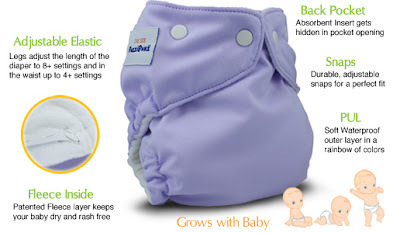 I received an email from a friend telling me that I should product review some cloth diapers. The first name that came to my mind was Fuzzi Bunz. Why wouldn't it be? They are trendy, cute, economical and revolutionary! Tereson Dupuy, the founder and inventor of Fuzzi Bunz was nice enough to send me 6 diapers to get me started on my Cloth Diaper Adventure. When I first got them, I was astounded by how cute and EASY they were. I had no idea that it would take me no time at all to change and dispose of poopies. I would have thought it to be a pain but it really is easy! Maybe I have my diaper Sprayer to thank for that! I have 6 diapers that are the standard, Medium size diapers and 1 One-size. When I am done washing my diapers, when I am folding laundry, I stuff my diapers to help with later diaper changes. At night, I stuff one extra insert into Dexter's diapers to help Mr. Super Soaker stay dry overnight. I honestly cannot say anything bad about cloth diapering. I love that I am cutting back on the trash that is being thrust into our landfills and I love that there are no harsh chemicals on Dexter's behind! As I continue with this excursion I will let you know all of the newest, latest and greatest moments. Last week, Heather won my Fuzzi Bunz contest. I am so excited for her because she using sposies now but is excited to try the cloth diapers on her baby's bum! 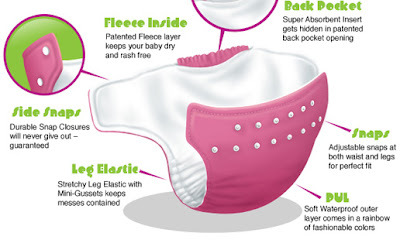 If you are not sure if cloth diapering is right for you, please feel free to email me and I would be happy to talk to you about my cloth diaper story. I love Fuzzibunz..we dont use them all the time, but they are great!! Emma had a really bad rash when we used them a lot. Not sure why, I washed according to directions. She has a sensitive toosh though. Glad you love them too! I love the snaps, a lot of my friends have Bum G. and they are velcro and guess what? The kiddo's are figuring out how to undo them!!! I use Toilebudz diapers and am really interested in the diaper sprayer. Would you recommend it's really good to purchase, and where did you buy it? I love FB and keep staring at the new OS dipes. I prefer sized CDs but for how much I loved FBs I really want to try the OS. I'm so happy you are using CDs!